""The GSP team did an amazing job and in a relatively short amount of time! They made us look good in our first turn as festival sponsor."" 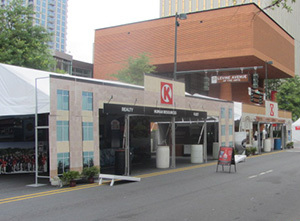 When the Circle K Southeast Division became the new sponsor of “The Circle K and Kangaroo Speed Street presented by Coca-Cola” event in Charlotte, they asked GSP to design an eye-catching tent. The event attracts over 400,000 visitors in the days leading up to the Memorial Day Weekend NASCAR Sprint Cut racing series. 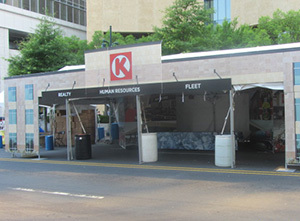 It was the first time Circle K sponsored an event of this magnitude and they wanted to make a great first impression with signage for the event. Since the race was one of the largest consumer events in the Southeast, GSP’s design team knew the tent had to be special. 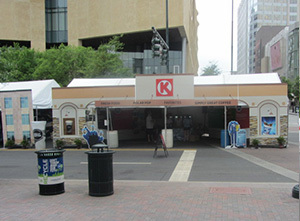 So they took it one step further and created a pop-up shop – a recreation of a Circle K store – complete with faux brick walls and lanterns. Life-size Polar Pop and Simply Great Coffee cups flanked the entrance, along with selfieperfect, racecar driver uniform standees. A Polar Pop costumed mascot also lured passersby into the store where they could cool off with a drink. 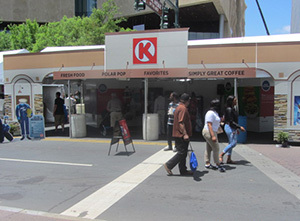 Circle K was very happy with the outcome and the traffic the pop-up shop generated before the Coca-Cola 600 race. And, as a bonus, they garnered unexpected media impressions as well, including a segment on Charlotte’s WCCB TV filmed in front of the recreated Circle K store and with the mascot on Speed Street.